Many people think Marmoleum flooring is marble. Although the name may confuse you, Marmoleum is actually the Forbo flooring company's brand name for linoleum flooring. Marmoleum is a popular choice because linoleum is one of the most environmentally friendly flooring materials on the market today. Linoleum is an all-natural material made from renewable resources. Linseed oil, wood or cork flour, resin, limestone and natural pigments combine to make linoleum. Linoleum is also recyclable, so it is a responsible choice due to both its origins and its end-of-life options. Most homeowners, however, don't need to worry about the end of life when they choose a linoleum floor such as Marmoleum. Linoleum is incredibly durable. It has been known to last up to thirty years in high-traffic commercial settings. In fact, linoleum earned the nickname "battleship linoleum" due to its strength. Another sustainable aspect of linoleum is maintenance. 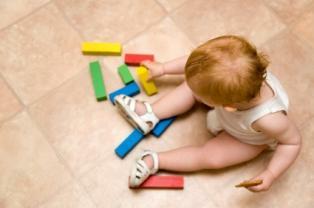 Marmoleum flooring, like all linoleum floors, can be kept clean by sweeping or using a damp mop. No harsh chemicals or excessive amounts of water are required. Linoleum was invented in the late 1800s and linoleum floors were popular in Victorian homes. By the 1960s, it had fallen out of fashion and was replaced by sheet vinyl. Today, linoleum is experiencing a comeback due to its vibrant colors, low maintenance and sustainability. Many people confuse vinyl and linoleum although they are very different products with very different attributes. Vinyl is a man-made product and linoleum is made from natural ingredients. Many sheet vinyl products are designed to look like linoleum and other materials such as hardwood, cork, and marble. Both flooring products are attractive, relatively easy to maintain and durable. Price and material are the main difference. Marmoleum comes in a wide array of colors and designs including relaxing earth tones, vibrant primaries, soft pastels, soothing blues and greens, and daring, bold colors. The weld rods required to install the floor also come in a mix of colors and patterns so you can create very interesting visuals on the floor. The collection totals more than 100 colors and coordinating borders so you can create a unique design that meets your personal style. You can use borders to frame a room, separate a sitting area or just create your own individual look. For best results, hire a professional who has experience handling linoleum to install your Marmoleum floor. Marmoleum click is a linoleum tile that is very easy to install. Click comes in 12 by 36 inch panels or 12 by 12 inch squares and has a patented click system. All you need to do is lay the tiles and click them together. There is no adhesive required so you can update a room in very little time. Tiles are a great option for high-traffic areas in the home such as hallways and kitchens because they can easily be replaced. Click comes in 18 colors. You can put Marmoleum anywhere in your home. Because linoleum is naturally antimicrobial and low maintenance, it is ideal for kitchens, bathrooms and bedrooms. Marmoleum is a good alternative to carpet for people who suffer from allergies. According to the Environmental Protection Agency, indoor air is more polluted than outdoor air. This is one of the reasons allergies, asthma and sick-building syndrome are on the rise. Dust mites and pollutants can get trapped in the fibers of a carpet. Because linoleum has antistatic and antimicrobial properties, this is not a problem. Marmoleum is sold at most major flooring retailers throughout the United States, or you can visit Forbo's website to access the Dealer Locator. You can also call 1.866.MARMOLEUM (627-6653) for a list of dealers.